It is not that the country's oil regulators have not accepted that trans fats need to be regulated since it impacts health. They just can't get their act together to set a standard (see box The five-year talk show). In January 2008, the Oils and Fats Sub-Committee of the Central Committee for Food Standards (ccfs) under the Union Ministry of Health and Family Welfare recommended a three-phase approach for setting the standard. In phase 1, by April 2008, the industry organization, cifti (Confederation of Indian Food Trade and Industry) and the directorate of vanaspati, vegetable oils and fats were to submit data on the capacity of manufacturers to meet a standard of 30 per cent trans fats in oil. In phase 2, by January 2009, the limit would be reduced to 15-20 per cent.In phase 3, in two to three years from then, the oil industry would be encouraged to bring down the limit further. But this was not implemented because ccfs's members wanted more information on the health hazards of trans fats from industry groups before they could legislate. Discussion on the standard started in early 2004, when the sub-committee noted the growing health challenges of trans fats. In August 2006, Ghafoorunissa, the chair of the sub-committee and former deputy director of the National Institute of Nutrition (nin) in Hyderabad, submitted a note on the health effects of trans fats. She noted in India there is no limit fixed for trans fats in partially hydrogenated oil. This oil is a major cooking ingredient in many states and is growing with changes in lifestyle and fast food. So even as the vast numbers in the country suffer from chronic under-nutrition, because there is not enough fat in their food, there is also a growing number, which is ill, because of what and how much they eat or overeat. Ghafoorunissa said studies to evaluate the effects of trans fats in vanaspati in India showed butter and ghee and trans fats increased insulin resistance. Trans fats were found to be worse because they inhibit metabolism of an essential fatty acid called omega 6, which helps the cell membrane function properly. Ghafoorunissa's work also showed that intake of trans fats during maternity increased the risk of diet-related chronic diseases. Based on the findings and worldwide concern, it was urgent for the country to regulate the content of trans fats in oil, she concluded. This was in August 2006. In its meeting in February 2008, ccfs concluded, "that by any stretch of imagination the issue of trans fats should not be lingered on... We should reach a standard of 5 per cent trans fats content, accepted globally, as these add to the health cost. People in the country are at increased risk of cardiovascular diseases." But Denmark, the first country to regulate trans fats in oil, has set the limit at 2 per cent. "The government is not interested," said Anoop Misra who heads the department of diabetes and metabolic diseases at the Fortis Hospital, New Delhi. He is also one of the experts whom the ccfs identified in February 2008 to send material on the proposed standard for his recommendation. Misra is yet to receive the material. The deadline is gone. The data is awaited. We are still at risk. The question is what is safe amount of trans fats in our daily diet. Our diet comprises the oil we use in our kitchen and the oil a company or a restaurant uses to cook the food we buy--from packaged chips to cakes and samosas. In January 2008, the US Food and Drug Administration decided to only label the quantity of trans fats in oil and food. US states criticized the move because they wanted better regulations. Some of them had already decided to go trans fats-free voluntarily in 2005. 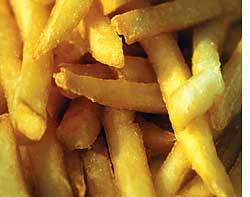 All restaurants in California had gone trans fats-free. Montgomery county in Maryland also banned trans fats. In 2006, New York became the first city to limit trans fats in its restaurants. Now Philadelphia has joined the ban and many other states are working on it. In Europe too there is a growing concern and regulations are being worked upon. There is increasing evidence of how trans fats impact the body (see box Six reasons you should not have trans fats). The question then arises why is the Indian government dragging its feet on this health matter, particularly, when experts point out that all studies show that trans fats found in Indian vanaspati exceeds the safe level. But many samples tested by cse lab had below 15 per cent trans fats, which means companies, if regulated, can meet this standard, to begin with. The minutes of the sub-committee meeting also corroborate this by quoting a study of 100 samples of vanaspati ghee by the Central Food Laboratory in Mysore, that said levels could be less than 8 per cent. So setting standards for this increasing global industry should be a piece of (trans fats-free) cake. In September 2008, the health ministry issued a notification for labelling of food, including trans fats, but with many loopholes. It said companies that made nutrition and health related claims must include the quantity of trans fats on their package. But without a standard, this amounts to nothing. 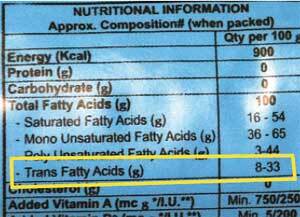 For instance, Rath vanaspati label says its trans fats are in the range of 8-33 per cent. The cse analysis found that this brand had 16 per cent trans fats--eight times above the Denmark standard. According to the Prevention of Food Adulteration Act, 1954, if the food, which uses hydrogenated vegetable fats, must declare on the label "contains trans fats". If a company says it is "trans fats free", it would mean that the product contains less than 0.2 g of trans fats per serving of food. Since there is little clarity on how the servings are determined, the rule too means little. The government, however, has given companies one more claim to market their product--trans fats free. The industry would like to prevaricate. "If you remove vanaspati from the market, there would be acute shortage of edible oils. There is no need to control trans fats now," said Velayutham Muthu, adviser with Bunge India Private Limited, producers of Dalda. The vanaspati industry wants an increase in melting point of its final product to reduce trans fats. To understand melting point, we need to go back to the process of hydrogenation. In complete hydrogenation trans fats are not formed and the product is a solid, the melting point is high. In partial hydrogenation, the product is a semisolid, forms trans fats and has a lower melting point. The industry wants an increase in melting point because it will reduce trans fats levels, they say. But it is not so simple. Studies by the National Institute of Nutrition in Hyderabad have shown that a higher melting point increases the level of cholesterol in serum. Other studies have said vanaspati at a high melting point is difficult to digest. Also, there is a standard for the melting point, set by Agmark, at 31-41C. "A manufacturer will not be prosecuted for high trans fats but will go to jail if he violates the melting point limit," said Biprabuddha Chatterjee of Adani-Wilmar Ltd. It is this standard that Bunge, supported by cifti, wants removed. Bunge has proposed that the melting point of vanaspati should be increased to 44C to carry out complete hydrogenation to reduce trans fats content. In January last year, the cii (Confederation of Indian Industry) argued if the melting point was increased to 45C, trans fats level of 1 per cent was possible. There are options to reduce trans fats. Some of them are expensive, industry-patented and require a different technology. For example, Cargill has a line of all-purpose, semi-solid fats, TransEnd, which are made of a blend of canola oil and fully hydrogenated soybean oil, with less than 2 per cent trans fats. Bunge Oils has developed a proprietary method to hydrogenate edible oils with the production of less than 10 per cent trans fats during the process. But these are not available in India. The other option is to use catalytic methods at relatively low temperatures. Another industrial way is to manipulate the fatty acid composition of oil seed using plant breeding and genetic engineering. A simpler way is to change the oil for hydrogenation to use palm oil, which has lower trans fats potential. Or to move towards naturally saturated oils like coconut. Denmark, for example, found that 70 per cent of the products had substituted partially hydrogenated products with coconut and palm oil. The problem is the Indian oil industry remains poorly regulated. It is allowed to mix oils. Technology allows it to get away, as it is possible to refine the oil and then doubly refine it so that we lose its feel and taste. If we don't know what oil we consume, how can we regulate its quality?